Create Embellish Adore: MONSTER MASH!! There is a HUGE birthday in the house today... but we are to remain quiet about it... since someone is acting like quite a monster about this age... I mean "REALLY?".. He went for a run and went to shot his High Power Rifle Match.. then he will get dinner - in the meantime - we are scheming against him... we have placed HIS MILESTONE age in different places that he will be able to find as the day goes on... like a leprachaun put them there! LOL... Sneaky I know... but its soo much fun! 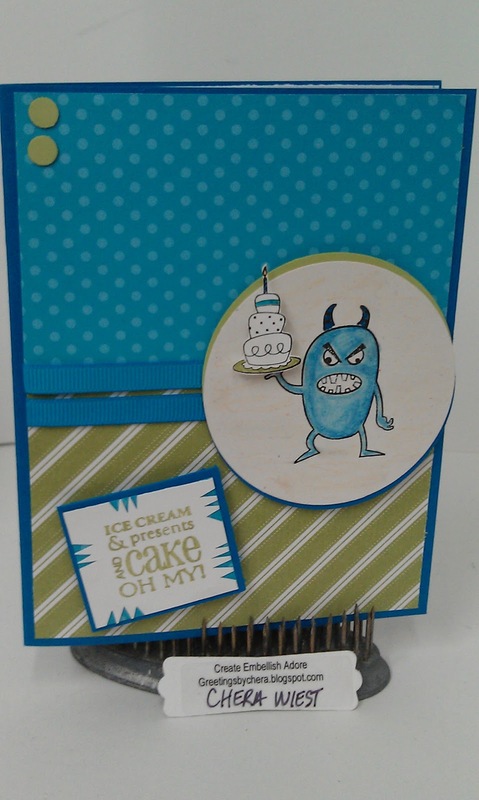 I used the Stamping 411 Color Inspiration for the card, somehow it spoke to me! I hope your holiday weekend is a great one! Please be safe! I have a whole lot of chores to complete but really do not feel like tackling them! You are hilarious, how funny is that!!! Love the card, this little monster is so cute.